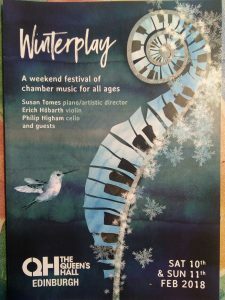 Just a month now until Winterplay, my mini-festival of chamber music in the Queen’s Hall in Edinburgh. The weekend of six events is designed to bring in listeners of all ages. We start on the morning of 10 Feb with a children’s ‘music and movement’ workshop run by Dalcroze expert Monica Wilkinson, who will lead a group of seven- to ten-year-olds in musical games based on themes from Schubert’s Trout Quintet, which will be played in the final concert. We have a young musicians’ showcase with music by Schumann and Saint-Saens performed by talented students from St Mary’s Music School. And on Saturday we have a pre-concert talk called ‘Unpicking the Classical’ by Robert Philip who will talk about some of the ways that Mozart, Beethoven and Schubert created their wonderful effects. We also have three concerts featuring two outstanding string players, Austrian violinist Erich Höbarth and Scottish cellist Philip Higham, playing with me in programmes of duo sonatas and piano trios including Beethoven’s Archduke Trio and Schubert’s B flat trio. For the final work we’ll be joined by violist Jessica Beeston and double bassist Nikita Naumov for Schubert’s Trout Quintet. In recent weeks I’ve found myself reflecting on a remark made by a colleague who said that people think a career in music is all about music, whereas in fact most of your time is devoted to admin. (I looked the other day to see how many separate emails I had written on the subject of Winterplay – so far there are 586, with a month still to go. And before you ask, a mass mailing is counted as 1! ) It’s astounding how much there is to attend to behind the scenes. As a freelance musician I’ve always known this, but when you’re organising a festival you basically get up each day with a list of tasks and finish the day having crossed off lots of items but added even more as a result. All of which means that, with luck, stepping out on stage with Erich and Philip for the first concert on 10 February will feel like a delightful liberation. Only music to think about! This entry was posted on Friday 12th January 2018 at 10:08am	and is filed under Concerts, Musings. You can leave a response, or trackback from your own site. I sympathise about the ratio of admin to music when you are working on project events like this! But what a wonderful thing for you to have set up. It sounds so well thought out and covers so many vital areas if we are to pass the baton of classical music on safely to the next generation. I wish it well! I think it’s inevitable, and it’s certainly true of instrumental teaching !!! If you look at it from the opposite perspective, many orchestral managers & Festival organisers are Music graduates.